Albert van der Sel : Introduction DWH, OLAP, CUBES, SSAS. In the series: Note 13. Subject: Quick introduction DWH and OLAP Technologies. 1. Background, and Datawarehouse (DWH) Technologies. 1.1 Data Warehouse technology and terms. 1.3 A few words on ETL. 2. A few notes and preliminaries before using Visual Studio (or BIDS) for building a Cube. 2.1 Create a fact- and dimension tables and loading some data. 2.2 Relation between Visual Studio (or "BIDS"), and SSAS. 3. Building and deploying a Cube. Chapter 1 is a fast introduction in Data Warehouse (DWH) terms and technologies (like dimensions, cubes etc..). So this chapter is quite "generic" and can be used by anyone who is interested in DWH. 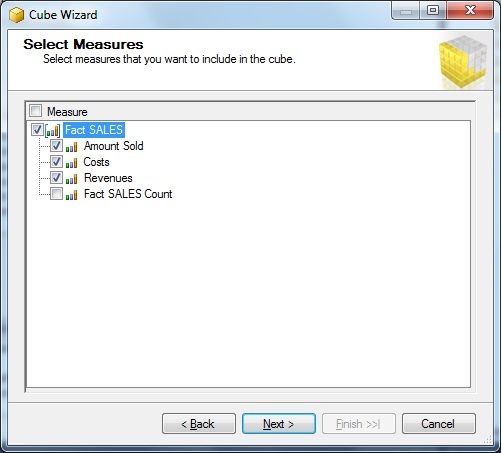 to implement OLAP technologies with cubes and other objects. If you want a quick and simple intro in "SQL Server Analysis Services (SSAS)", you best read all 3 chapters. If you want some simple information on DWH with OLAP/Cubes, then only chapter 1 should be enough. This is an very simple and short intro in DWH Technology. Here I presume that you know SQL Server, or any other RDBMS like Oracle, reasonably well. So, you "know your way" with tables and indexes, and you (for example) know what Primary keys and Foreign keys are used for. Let's first spend a few words on the above terms, which are all interrelated. transactions, but they are usually not used or suited for storing all sorts of "aggregates" or "summarized data" and analysis. 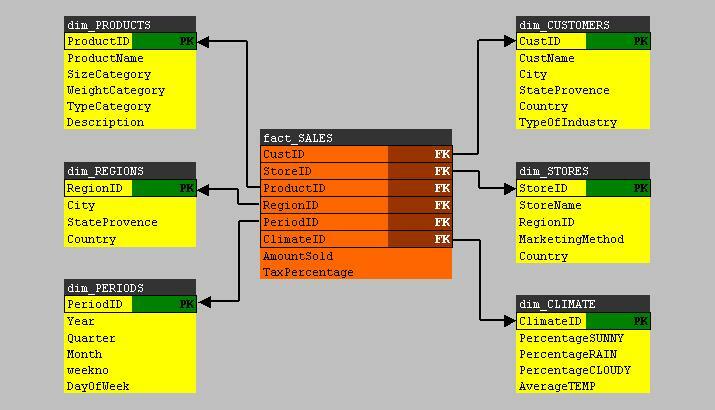 In such OLTP database, most queries which are specifically designed for analysis or summaries, often use many "nested joins"
which may severely impact the performance of that database. to find answers that might be sort of "hidden" in the bulk of all those individual databases together. loaded with data from all other relevant databases. could be a mix of Oracle, or SQL Server or whatever other type of RDBMS). Let's call that "bunch" of source data, "the primary sources". from all those primary sources. The tables in the DWH, are usually one or more "fact tables" and a number of "dimension tables". Let's assume we have just one fact table, and a small number of dimension tables (like 5 or 6 or so). What exactly the fact- and dimension tables represent, will be discussed below. Here we arrive to the true heart of the DWH. source databases. We cannot expect that the "layout" of all tables over all those databases, are the same. Indeed. We can expect that there are quite some differences between the core tables in those 5 primary source databases. about repairs at customers, etc.. etc..
from those tables in the sources. Ofcourse, there might exist relatively simple fact tables, but usually it's quite a challenge to design one. For one thing: you need to know "the business" quit well ! Also, you can imaging that it could be quite some challenge too, to load this fact table with data from the sources. Suppose you have one fact table, called "fact_SALES", containing all sorts of facts around the sales of a company. So it is a large bunch of records, pure data, listing for example ProductID's, StoreID's, RegionID's, PeriodID's, AmountSold, Revenues etc..
you can measure it along the x-, y- and z dimensions. Now, in DWH thechnology it works quite the same way. the products. And we might have a "regions" table, which describes all the characteristics of the different regions where our Stores are located. The point is, that you can design queries that joins the fact table with one (or more) dimensions, which let's you 'measure"
where all the Regions are stored in a dimension table (for example the dim_REGIONS table). are located all around the fact table. It's neccessary that the "fact table" uses Foreign Keys, which all points to Primary Keys in the "dimension tables". is "unique" (garanteed by the Primary Key). So, it simply just lists all customers. using the PK-FK relation(s), which should enhance performance. Indeed, using the star-like schema, also the number of joins can be kept to a minimum, as compared to the usual joins used in an OLTP database. You have consolidated data from multiple sources and databases in one DWH. Thats very good for business analysis. You have off-loaded, or seperated, "analysis" from your regular OLTP databases. Additional resources must be available like cpu power and Storage, which could be very significant. Additional support and manpower is needed which can vary between "some light work", to a whole department involved with the DWH. In some cases: A DWH "lives" and it never seems to get quite finished. one or more dimension tables (at the "fringes") which are linked to first dimension tables, but not to the fact table. But for our discussion it's not really a fundamental difference. information. This is often done to "pre-calculate" all sorts of summations and averages, so that information can be queried quickly. implement a model for a DWH. However, alternatives exists, and even non-relational alternatives exists. If you take a look again at the fact table in figure 1, then you see a lot of Foreign Keys (pointing to the Primary Keys of the dim tables). where analysts are most interested in. This sort of columns in the fact table, are called the "measures". like sum(), avg() and that kind of stuff. If we follow that definition, the "AmountSold" in the fact table, would be a true "measure". However, be aware of the fact that in many DWH docs, every non-FK column in a fact table, might be called "a measure". while in that query, you "group" by StateProvence and you also "summarize" on the AmountSold. This quickly leads to insight where, viewed from geographical perspective, the subtotals of AmountSold values are high and low. for example the year, quarter, and month columns. Now, we know that "a year" contains 4 quarters, and that a year spans 12 months. or the other way, "roll up" along such an element in the hierarchy. It means that you then switch the view from "detail" to "summary". Ofcourse, not all dimension tables need to have such an hierarchy implemented "perse". Due to the fact that the source databases change over time, the DWH needs to be "refreshed" periodically as well. For many businesses, once a week (or maybe once every night), the DWH will be refreshed. In many cases, it means that all tables gets truncated and will reloaded from the source databases. As said before, this will be often done in a weekly (or nightly) batch. However, if a DWH is really very large, the refresh is quite some operation, and the periodicity might be lowered substantially. and "Incremental Loads" where only new and altered data is loaded. with a higher freqency, like once every night. changes in the (operational) OLTP databases will be refelected (near-realtime) in the DWH as well. But this in not seen very often. One example implementation could be the use of CDC and streams in Oracle. The loadprocess itself could range from "fairly simple" to "pretty tough", all depending on the size and complexity. and usually no updates and inserts takes place. and an Operational DataStore (ODS), and then the actual DWH where the facts and dimensions live. the data and store it in the ODS. Then, the final round might be that the data in the ODS gets loaded into the "real" DWH. while other jobs see to it, that the true DWH gets loaded. Ofcourse, in a really simple DWH environment, it might be so, that even the use of Staging area is unneccessary. It just depends on the complexity of the load/transformation actions. The loading and transforming of data, falls under the concept of "ETL", which is short for Extracting, Transformation, and Loading. Up to now, we considered that the DWH is build from other operational OLTP databases. But in reality the sources could be "very"
divers, like for example: Databases, flat files, Office documents, XML documents etc.. etc.. Indeed: that's a complex variety of "sources". Needless to say that the ETL processes involved, might be quite complex too. In the Microsoft "world", ETL is often implemented using socalled "SSIS" packages. SSAS (SQL Server Analysis Services) is the subject of this note, so we will see more of this environment later on. It's mainly involved with socalled "cubes". SSIS (SQL Server Integration Services) enables you to perform ETL from various sources, into various destinations like a SQL Server based DWH. SSRS (SQL Server Reporting Services) enables you to create "Reports" from various datasources, of which a DWH could be an excellent source for reporting. In SQL Server 2012, the three products still form the "core" of BI, but quite relevant additions were made. was added for the "opensource" product "Hadoop". Apart from Microsoft, many third-party vendors deliver BI tools too, ranging from fairly simple products to quite complex environments. The figure below depicts a birds-eye view of the processes and area's that might be involved in a (more or less) typical DWH environment. Not all DWH's are designed with a Staging area, ODS, DWH area etc.., or use a "Star/Snowflake" model of fact- and dimension tables. and there are a number of pre-populated aggregate tables. pre-defined "Reports" are available for users. It might just work..., just depending on the type of business and other factors. Here we are going discuss OLAP and cubes. then "populating" (or calculating) the cube, and from there on, perform "multi-dimensional" analysis of the data in the cube. OK, but what is a cube then? as a basis for creating a cube. (analog to a 3D cube), and is created by the OLAP software. In our case, the OLAP engine is SSAS. positioned horizontally (on the floor so to speak), and the "dim_PERIODS" dimension table is fold vertically, we get a 3D object. It will be the floor and one side of a cube. Now the trick is: the OLAP software will calculate all aggregates of a measure (like AmountSold) over all values of the dimension. all months, AmountSold over all weeks in a month. The same is done with respect to any other Dimension you have added to the cube. Now the remarkable thing is: the cube "knows" the answers to all posible queries already in advance. Every summation, or average etc..
is already calculated (!) and stored in the cube. "populating" the cube, might take quite a while (for example: a few hours or so, or even longer). for querying by your analists. better compared to a regular Relational model. You get it? If yes, you are there! The rest, like using tools to create and maintain a cube etc.. is just "mechanics". Although it's a very simple starschema, we can build a "cube" from this model. in those numbers, especially if they can easily map it to Regions and Periods. That's information ! - YEAR contains QUARTERS which contains MONTHS. - COUNTRY contains STATEPROVENCE which contains CITIES. You can almost see it happen when you build and populate the cube. AmountSold, Costs, and Revenues per Month/City etc.. etc.. This information will be available directly, once the cube is fully build (fully populated). Marketeers and other analysts will get their numbers very quickly. Using the right BI tools, they can "roll up" numbers to get summarized data, or "drill down" to childs to get detailed numbers. You know that with the "usual SQL", you can query the regular (2 dimensional) tables in an ordinay database (like a DWH or OLTP database). Standard SQL is already a great tool, also for creating fantastic reports with all sorts of summaries, by just querying ordinary tables. much power is in your hand. But this is to be used for regular databases. So how can you retrieve data from a cube? - Several BI tools makes that possible. - Combining SSAS with SharePoint 2010 is a promising path to follow. - Some Office components (Excel 2010, webcomponents) allows it too. - Or you write MDX queries. MDX is short for "Multidimensional Expressions", and MDX queries makes it possible to SELECT data from multidimensional datasets like a cube. use to query regular tables. In it's basic form, the MDX statement looks familiar, because it is in the usual form "SELECT .. WHERE .. FROM (cubename)". However, since you navigate along certain "axes" in the cube, you specify those with the "ON COLUMNS" and "ON ROWS" keywords. will be the "measures" of interest, specified by the "ON ROWS". - "Loading", meaning how to get data into the target database. Sources of data can be anything. or any other professional type of RDBMS. So that's usually the target type of database. XML files, Office documents etc..
schedule them too (from e.g. the native job-agent belonging to the RDBMS, or the OS, or other sort of scheduling). But the RDBMS itself usually has lots of facilities too, for example "prompt tools", but GUI like too. This is certainly true for, for example, Oracle and SQL Server. 2. A few notes before using Visual Studio or BIDS for building a Cube. 2.1 Create a fact- and dimension tables and load some data. Our goal is to build a cube. It will be based on a simple starschema. So, we need some actual tables with some data. a fact table and three dimension tables (just like was shown in figure 3). I hope you have some SQL Server test system lying around somewhere. In the instance, create a database called "TEST" (or use some other name). From the Management Console, start a Query Window, and make this TEST database your current database. Copy and paste the following script in your Query Window, and execute it. The script will only create the tables, and load some sample data in them. As an exercise, you probably want to view a nice graphical datamodel of your DWH. In the Management Console, click the "+" symbol that you see in front of the TEST database. This container will fold open, and you probably will see the "Database Diagram" as the first sub-item. Right-click the "Database Diagram" and choose "New Database Diagram". It is easy to follow the steps that will follow. The result will be a nice graphical "Entity Relationship Diagram" of your four tables. Now that we have a DWH with tables and data, we can play, and we will create a cube in Chapter 3. 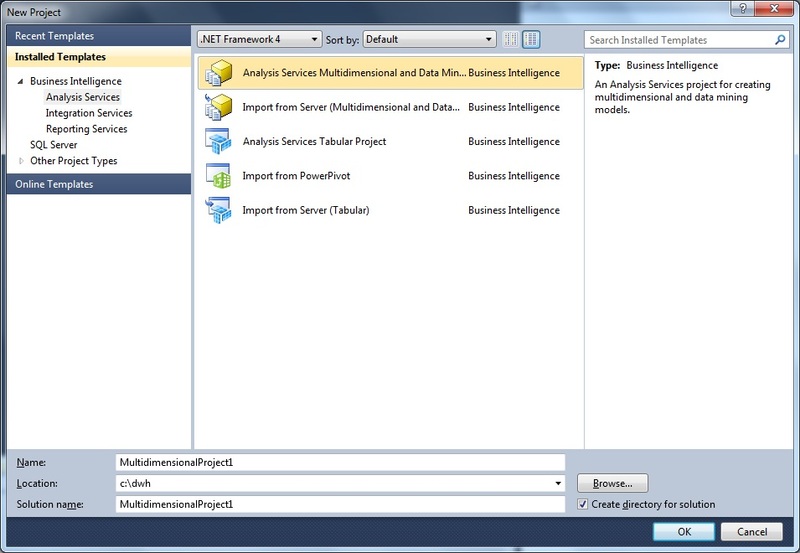 2.2 Relation between Visual Studio (or "Business Intelligence Designer Studio"), and SSAS. On the one hand, we have a SQL Server database, which is our DWH (the fact table and dimension tables). A (multidimensional) cube is something like an external entity, actually considered to be "loose" from your DWH. Connections to the DWH exists only when you populate it with data (there exists some exceptions). Once loaded, the cube is again disconnected from the DWH, until the next refresh (the next re-population). You might have two questions now. ⇒ How does one create a cube from the tables in a DWH? ⇒ Where is a cube stored? which both are pretty much the same thing. Once you have build the cube, then you "deploy" it, meaning that metadata gets registered with the SSAS service. You probably know, that with SQL Server Management Studio, you not only can connect to a Database Engine, but to SSAS too. you can see all properties of the cube, like which fact table and dimensions it contains, and many other properties. Also, when connected to SSAS, you can also lauch MDX queries using a Query Window. But a (molap) cube will not be stored in a SQL Server database. when cube is designed. For example in the MOLAP case, it will be stored on disk, perhaps in multiple "partitions". So, here the cube is not stored in the database. It will often use a "proprierty" storage structure on disk(s). we usually understand to be a (multidimensional) "cube". This is the model we study in this note. in this document (and created by the script of 2.1), actually are (simple) ROLAP implementations. create a cube, while the "relational" part of ROLAP refers to the storage/caching model (which uses the DWH). So with ROLAP, we do not have such a multidimensional cube, as we do have with MOLAP. - HOLAP. Some hybrids forms exists as well. In this note, we will use MOLAP, which also means that we create and study Multidimensional cubes. In such a case, it's not stored in a SQL Server database, except for some metadata. you could define "measure groups" which might be stored on different disks. This section will show you a few screendumps of using Visual Studio (or BIDS) on how to build and deploy a cube. It's not very hard to do, once you have a starschema which forms the basis for a (molap) cube. only then you actually will register the metadata with the SSAS service. From then on, you can "see" it too from the "SQL Server Management Console" (SSMS), if you are connected to SSAS. Then, you could use it from Sharepoint, or use Excel, or use MDX queries from the Management Console etc.. etc.. So, deploying a cube, is like "making it alive for access" (under the control of SSAS). You still need to populate the cube, but access control goes through SSAS. parent and child aggregates are calculated (see chapter 1). The population of the cube is a seperate step, which can be repeated later at any time. In most cases, the cube is only "connected" to the DWH, when it gets populated. At all other times, it is just disconnected. If using SQL Server 2005/2008, you may find the "Business Intelligence Designer Studio" in your Start Menu. With SQL Server 2012, it's possible that you only see "Visual Studio", but both tools are actually quite the same thing. Start up Visual Studio, click File, click New, choose "Project". Since we want a molap cube, in the following dialog box, choose "Analysis Service Multidimensional and DataMining". Note that I store the project in "c:\dwh". You might choose a similar location. After step1, Visual Studio will show you several "sections" on your screen. Note the "Solution Explorer" (per default on the right side). First we will create a "Datasource" which is not much more than creating a "connect string" to the DWH. This is logical: your project "needs to know" to which SQL Server instance, and to which database, it should connect. So rightclick the "Datasources" container, and choose "New Datasource"
have to select a Server instance, and a database, and which credentials for the connection should be used. I skip those dialogboxes, because it's likely you have seen similar dialogboxes before. It's quite simple anyway. Give the Datasource a name like "Test" (or some other name you like). However, there might be one small optional "hurdle" to take, which is the "select impersonation information". Here you can choose from several credentials which your project will use when you deploy it. If, at the final step, the deploy goes wrong, it could well be due to your choice of the account used (insufficient permissions). Once the "Datasource" has be set, now we can choose the objects (fact and dimensions) which will form the basis of our cube. For this, rightclick "Datasource Views" and choose "New Datasource View". 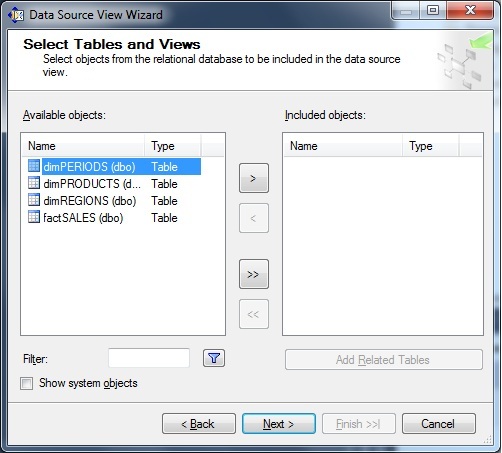 The "New Datasource View Wizard" will startup. First, select a "Datasource". This will be the Datasource as was created in Step 2. 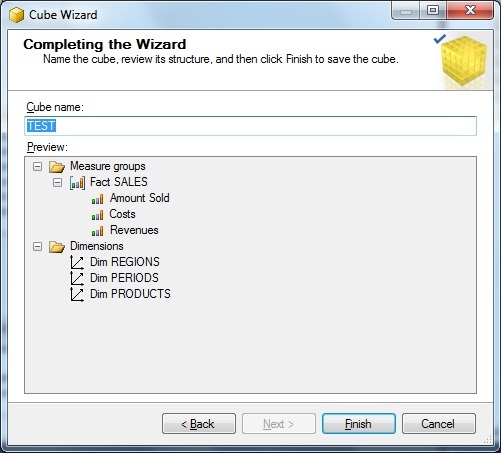 The next screen allows you to select the tables which form the basis of our cube, as shown in figure 6. Select all relevant objects (in our case: dimREGIONS, dimPERIODS, dimPRODUCTS, and factSALES). Next, provide a name for your "Datasource View", like "Test" and click "finish". Your Visual Studio screen will alter into a screen similar to figure 7.
the ".dsv" extension (in my case "TEST.dsv"). If you browse through the "c:\dwh" folder, you will also see the associated physical files. which points to the objects (tables) which form the basis for our cube. 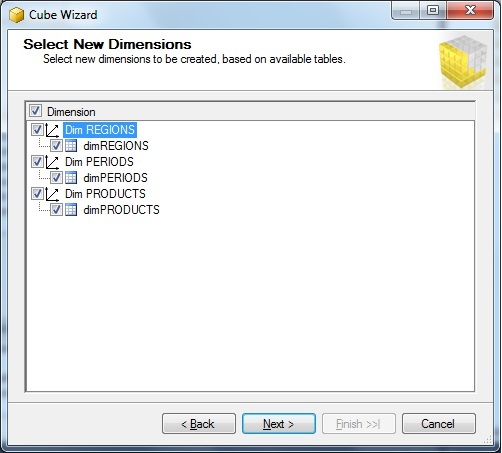 In the Solution Explorer, rightclick the Cubes container, and select "New Cube". The "New Cube Wizard" will start, which will guide you through the design process. 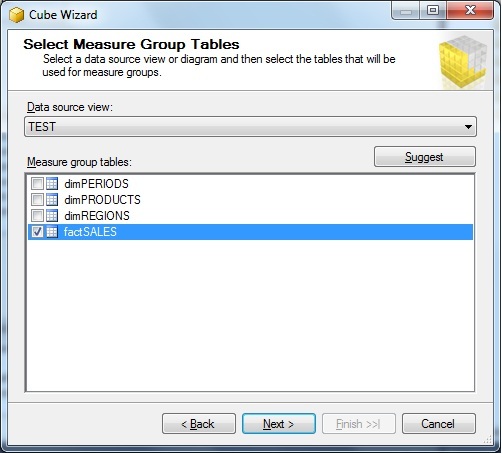 a number of options, like "Create an empty cube", or "Use existing tables". We already have tables which form the basis for our cube, so please select the "Use existing tables" option. is actually meant, is that you select the "fact table" here. So, here we select the "factSALES" object. or just a selection of certain measures. That's why the next dialogbox enables you to pick all measures, or just a selection. Here, ofcourse we choose all measures. See figure 9. Next, we can choose the dimensions we need in our cube. Here too, we select all our dimensions. See figure 10. The last dialogbox, let's you choose a cube name. Here I choose the name "Test", but you can choose whatever you like. If you click "finish", your are done designing your cube. Up to now, we have designed the cube, and stored "the source code" in some folder (in my case, it's the folder "c:\dwh"). When you deploy the cube, you register it at the SSAS service. So, the deploying is a neccessary step to take. First we "build" the cube, hereby creating some binaries, XML files, and a setup script for registering the cube to SSAS. Then we "deploy" the cube, which actually registers it with SSAS. From the main menu in Visual Studio, click the "build" option and first choose "Build Solution". Database [MultidimensionalProject1] : The database has no Time dimension. Consider creating one. no actual field with a Datetime datatype. This is indeed true, so we ignore that warning. Anyway, the build was successfull. From the main menu in Visual Studio, click the "build" option again, but this time choose "Deploy Solution". Performing an incremental deployment of the 'MultidimensionalProject1' database to the 'localhost' server. Yes, de deployment was successfull! To actual "fill" the cube with aggregates and data, we need to "process" or "populate" te cube. Ïn Visual Studio, you richtclick your cube and choose "Process". However, if it is anticipated that the data volume is very large, this could take some time, and diskspace. and if you (are going to) work with large cubes, you still have a lot of research to do. One thing is already clear: the better optimized the underlying fact and dim tables are, the better performance will be. From the Windows Start Menu, you might take a look at the items found under the "Microsoft SQL Server 20xx" -> "Analysis Server". Here, the Deployment Wizard" can be found. You can run the Wizard interactively (in a graphical way), or you can use it from the command line. You might want to investigate what the Wizard can offer you. It must further be clear that this simple note does not say anything sensible about tuning cubes. Indeed, this note is no more than a general and simple overview. Once "populating" or "processing" has completed, you might view your cube data using Excel 2010, or you might try some MDX queries.